Pancake has been my favorite. Walking snack street every time, always a variety of pancakes in my eyes. Today, I bought a recipe and learn to cook purple sweet potato pie. 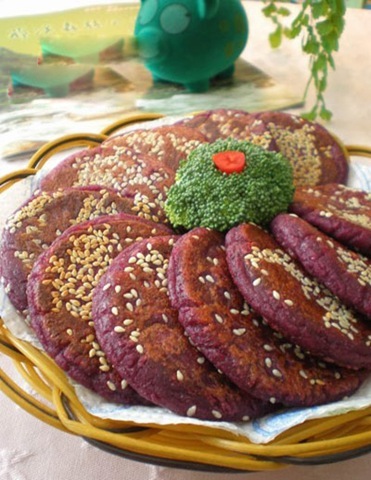 Purple sweet potato 250 grams, 150 grams of glutinous rice flour, corn flour 50 grams, sesame seeds, the amount of sugar. 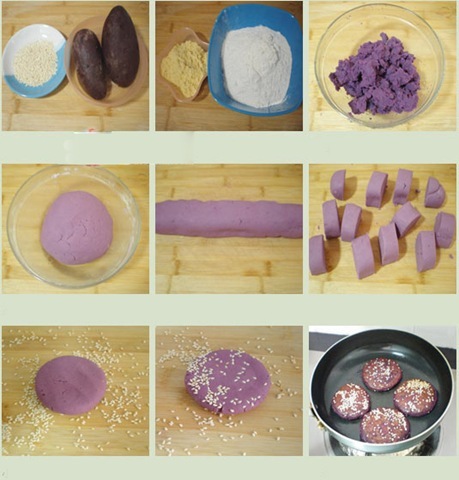 And then, Mix the glutinous rice flour, corn flour and sugar , pour in the purple mashed potatoes, then add the right amount of water to knead dough.And make into a small round flat cake like above pictures. At last, put the small round flat cake into oil pot, fried swelled slightly , and turn slightly yellow to the middle. Purple sweet potato pie is finished.